If there was ever any doubt that Japan is home to the latest and greatest in RFID technology, then a new home-security system from NTT DoCoMo should blow such clouds clean away. 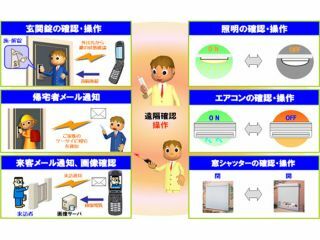 On the back of successful trials, the mobile-phone giant has just launched the first commercial venture to use RFID-equipped phones as an integral part of an electronic house of the future in eastern Japan. A new housing development created by developer Sekisui House in Tochigi Prefecture, northeast of Tokyo, features DoCoMo's osaifu keitai (wallet phones) at the heart of each home's security features. The 12 dwellings each have RFID terminals at the front door that grant access only to someone carrying a phone with a pre-registered osaifu RFID chip, but that's not all. Those same phones can also connect by the internet to a home server that allows residents to switch on air conditioners, lights, heaters and even to snap photographs via a door intercom of unexpected callers. Householders can also choose to receive an email report on anyone entering or leaving the house using a phone key. All of this can be done from anywhere on DoCoMo's nationwide phone network. As for cost, DoCoMo's Shuichi Ichikoshi told us: "The system adds a few hundred thousand yen [£1,000 and up] to the cost of each house, but that will be borne by the developer. The running cost to the consumer will be just a few thousand yen [tens of pounds] per year." DoCoMo clearly has plans for the technology - Ichikoshi says, "This is not a trial - it's actually a commercial launch covering 12 homes, a number that will eventually rise to 67 houses." While we love the idea of being in total control of our lives, the Big Brother element clearly needs to be carefully monitored.